Comparison Between Android 5.0 L and iOS 8: Which One Performs Stronger? Both Google and Apple addicts are awaiting the arrival of the next operating system for mobile devices like kids on Christmas morning and finally the two heavyweight incarnations Android L and iOS 8 make their entrances at developer conferences, WWDC and Google I/O. Well, after the Apple reveals the mysterious veil of iOS 8, many Apple fans, if not all, seem not to be the same surprised as Android buffs to Android Lollipop. This actually really matters since good innovations tend to swerve their way from one OS to the other. Agree? But which on earth is better for you, Android Lollipop 5.0 or iOS 8? Probably it's too early to reach the conclusion now since you might don't get the thorough understanding about the two operating systems. So here we compare the latest Google Android L with Apple iOS 8 from all sides and aid you to have clear comprehending about their pros and cons. 5KPlayer - let you 100% free AirPlay video music from iOS 9 iOS 8 iPhone 6S/Plus/6/6+, iPad Pro, iPad mini 4 to MacBook 2015, iMac 5K/4K, PC Windows 10/8. No adware, spyware or malware. Admit it or not, the design of iOS 8 is mostly unchanged from its predecessor iOS 7, which is no surprise as it was iOS 7 that brought the major design changes. iOS 8 has that simplistic design follow the minimalist aesthetics and meanwhile doesn’t compromise the easiness for users. Compared with Apple iOS 8, this fall, Google Android 5.0 Lollipop has infused a new "Material Design" look, which is consistent across Android, Google Chrome, Chrome OS and Android Wear. This design language essentially adds depth by adding shadows to objects and makes it so that everything is animated. Though Android L and iOS 8 derive from different companies, Android L and iOS 8 have something in common. See, they both support 64-bit processors, with Apple rolling out the support in iOS 7 and Android L 5.0 being the first version of Android to offer it. Google Android 5.0 Lollipop, coming with a downright new runtime: the Dalvik compiler has been dropped in favor of ART, which gives apps a rather large boost in speed. And iOS 8 sports with the extra processing power that some chips can provide with the help of Metal graphics API that will allow games developers get more power than ever out of Apple's mobile devices. It's claimed that the new battery saving mode built-in Android 5.0 L will prolong Nexus 5 life support with 90 minutes more. And the test (by Ars Technica) reveals that the devices running on Android Lollipop do get battery life boost of 36% (around two hours) where webpages are loaded over Wi-Fi. Well, in testing to date iOS 8 doesn't seem to improve upon battery life in any consistently measurable way. One improvement is that iOS 8 now shows a power usage screen to let users see exactly where all their battery juice is going (Android had this feature long long ago). And it's always the phenomenon that Apple slims down the new iPhone models but with nary increase in battery efficiency. Since iPhones are notorious for their poor battery life, there seems a large room for Apple to improve in battery life. It's mentionable that Google has added new features in Android L-the direct links to apps from Google searches in the Chrome browser and that Apple's innovation is 'Today extensions' which can appear in the 'Today' view in iOS 8's Notification Centre. Plus, both Android L and iOS 8 own fitness and health tracking platforms: Apple's offering is called Healthkit, which functions well with the new Health app, while Google's is called Google Fit for Android 5.0 devices. Moreover, there are also some interesting yet helpful features both Android L and iOS 8 have, like Apple's new 'Hey, Siri' trigger and Android's 'Ok, Google' activation; free digital wallet Google Wallet and Apple Pay (US-only now); Android Auto and Apple's CarPlay to offer you info (map, music,etc.) and controls on your dashboard's screen, etc. If you are the Android L or iOS 8 user, you can't miss them. * The new UI dubbed Material Design. * Offer a unified experience for the OS across different devices including smartphones, tablets, wearables, TVs, etc. * Better control over battery life with Project Volta. * Display: a bit less detail screen. * Android wear where the screen is far smaller, it will be nearly impossible to read updates. * Lack of impressive messaging system and Google voice control. * Phone security no improved since Android is one of the most vulnerable platform currently. *Continuity between Mac OS and iOS. *QuickType, 3rd-party keyboards and new features in Mail & Messages. *New spirit of openness for app developers. *Bring Apple's fingerprint scanner Touch ID for all latest iPhone iPad. *Cellular connectivity died and Touch ID working unstably. *Wi-fi and battery drain problem. *Applications crashing and freezing in iOS 8. *Undesired performance iOS 8 brings to iPhone 4S. Upgrade iOS from iOS 8 to iOS 9, Any Problem? After the aforementioned comparison between Android 5.0 Lollipop and iOS 8, I bet you have clearer understanding about the two latest operating systems. No matter which one you favor, it's undeniable that both of them have a huge leap forward in general and they especially benefit the multimedia enthusiasts since they give the latest Android L onboard Google device and iOS 8-powered iPhone, iPad a big progress in speed and performance. So the multimedia buffs can enjoy their digital entertaining life on these Android L or iOS 8 devices with greater satisfaction. That being said, a triva still bothers you now and then. That is the limited video audio formats supported by Android and Apple iPhone iPad, which lead you unable to access to the streaming video file downloaded from online or some HD video recorded with your camcorder. In such case, resorting to an all-round video converter is of essence. 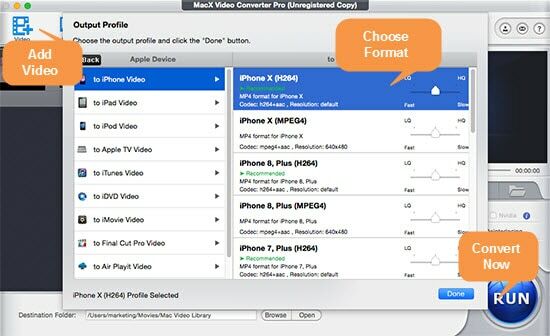 Here the highly acclaimed Swiss Army Knife-MacX Video Converter Pro is the best bet to do this task, which allows you to convert any video to Android L Nexus 6/9, iOS 9 iPhone 6S/Plus, iPad Pro, iPad mini 4, iOS 8 iPhone 6/6+, iPad Air 2, Apple TV 4 within mins, including MP4, MOV, AVI, MKV, FLV, 3GP, AVCHD, MTS, etc. And also an outperformer to record on-screen video, make photo slideshow and edit video, etc.